England smashed the record for their highest ever one-day run chase to beat New Zealand by seven wickets at Trent Bridge and level the series at 2-2. By reaching their target of 350 in only 44 overs, England beat their previous best of 306-5 against Pakistan in 2000. 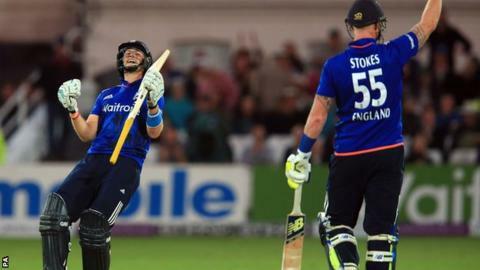 Eoin Morgan and Joe Root both made centuries and shared a stand of 198, while Alex Hales crashed a 37-ball 68. New Zealand posted 349-7 thanks to Kane Williamson's 90 and Mitchell Santner taking 28 from an Adil Rashid over. In conceding four sixes and a four, Rashid sent down the second most expensive over ever by an England bowler in ODI cricket, behind Steven Finn's 29 against the same opponents at this year's World Cup. The Rashid over, another high-class Williamson knock and yet more dropped catches had the potential to send Morgan's men to a defeat that would have sealed a New Zealand victory in a thrilling five-match series. But a further show of batting positivity in front of a raucous Trent Bridge crowd led England to the joint fourth highest chase of all time and a decider at Chester-le-Street on Saturday. Although Morgan (113) and Root (106 not out) did the bulk of the work, their task was made easier by Hales. As New Zealand bowled too short on a flat pitch, Hales, on his home ground, repeatedly blazed through the leg side, clearing the boundary on four occasions. He was supported by Jason Roy, who made 38 in an opening stand of 100 that ended when Hales was bowled heaving at Matt Henry. The same bowler had a blistering Roy drive held by Williamson at short cover 11 runs later, but England had no thoughts of consolidation, with Root and Morgan continuing a free-scoring charge with remarkable control. Captain Morgan played the aggressor, dancing to play a glittering array of straight drives and huge lofts down the ground. Striking the ball cleanly, the left-hander hit five sixes in the arc between long-off and deep mid-wicket, the last of which brought up his eighth ODI hundred from 73 balls. Root, dropped at slip by Ross Taylor off Mitchell McClenaghan on nine, was busy in support, also driving straight and nudging on the leg side. "I don't believe I've just seen that. Even the staunchest England fans wouldn't have given them much hope there. Eoin Morgan has gone through hell in the last year with the bat, and bounced back incredibly well. Joe Root has been overshadowed by him, yet he's scored an unbeaten century at more than a run a ball. England haven't been ahead of the game in one-day cricket for a long time, but they've taken stock and aped New Zealand completely." Their partnership, England's highest in an ODI against New Zealand, ended when Morgan hooked Tim Southee to long leg. Root remained, went to a 94-ball hundred when a diving Santner failed to hold a top edge and, in the next over, pulled the boundary that completed victory. That seemed unlikely when Santner launched his assault on Rashid, undoing England's good work in halting New Zealand's progress. As England bowled too full early on, openers Brendon McCullum and Martin Guptill shared a stand of 88, with Williamson and Ross Taylor then adding 101 for the third wicket. When Taylor was pinned lbw by Finn at the start of the batting powerplay, England began to fight back. Finn and Mark Wood registered 1-51 and 1-49 respectively but had bowled all their allocation well before the end of the New Zealand innings, leaving Rashid exposed. In a show of character, he recovered to go for only four runs and a leg bye in the 50th over, leaving England needing 350 for victory.